More than 12 million* Indians live in absolute darkness (i.e. they suffer from total blindness). But there are many ways to reach out to them, and one of them is through Braille-typed text. This World Disability Day, let’s break barriers to build an inclusive society that ensures development for all. At a time when one doesn’t even buy a phone without an informed research, the right to information is being denied to people who are visually impaired or blind. India has the more blind people (12+ million) than any other country in the world. That’s roughly equal to the total population of Jammu & Kashmir, or the total size of the electorate of Haryana in 2009. 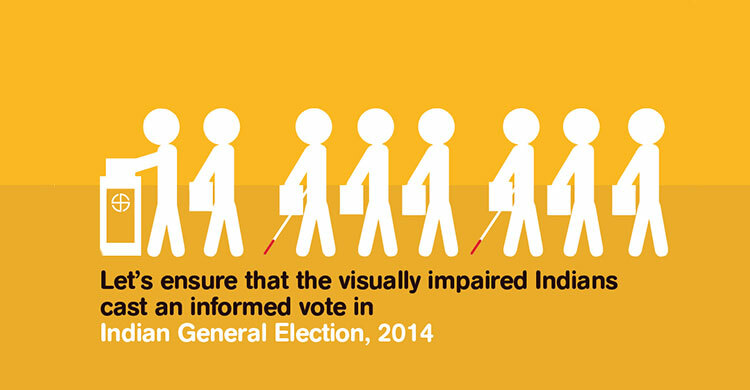 From a political perspective, this segment of the population will play an increasingly important role in deciding the outcome of an election, so political parties can no longer afford to ignore the rights and interests of people who are visually impaired. Be a part of our World Disability Day campaign.